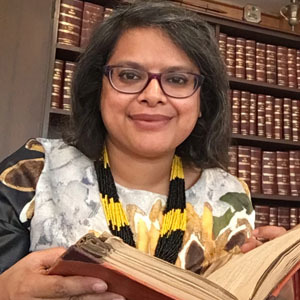 During spring semester 2018, Romita Ray charged the students of her Art and Architecture at SU seminar to select an artwork or architectural drawing in the art collections at SU for intensive study. The seminar provides an immersive experience with objects in the SUArt Galleries, Light Work, and the Special Collections Research Center—examining them and learning to conduct archival research about them, says Ray, associate professor of art history and chair of the Department of Art and Music Histories. For example, Adam Hsu ’19 focused on the famous Margaret Bourke White photograph, Mahatma Gandhi and the Spinning Wheel, while Max Greenblatt ’18 studied Salvador Dali illustrations for “Alice in Wonderland.” Angela Tillapaugh ’18 chose the Anna Hyatt Huntington sculpture “Diana of the Chase,” while Christina Rosace ’18 studied an image of the goddess Durga from the collection of Indian calendar art amassed by former SU religion professor H. Daniel Smith. In addition to a research paper, the students shared their findings with each other and with the campus community through Eight + One, a scholarly magazine they produced featuring op-ed-length essays about their research subjects. The magazine, the first of its kind produced at SU, was meant to be “a lasting record of the hard work the students put in,” says Ray. 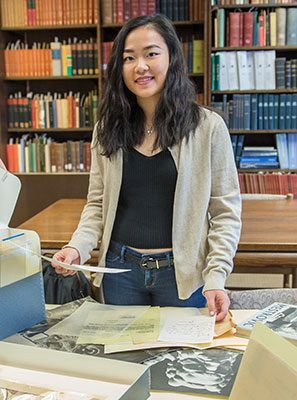 Tammy Hong ’18, who studied Hyacinthe Rigaud’s paintings of Louis XIV, says that while she was delighted to immerse herself in the SU collections and share some of the gems contained with the SU community, the magazine project was particularly valuable for honing her writing. “The rigorous editing process made me realize how polished my writing had to be in order to produce a thought-provoking and concise piece,” says Hong, currently the Andrew W. Mellon Research Assistant in Modern Materials in the Conservation Division at the National Gallery of Art.